The first Zionist diamond features a distinctive Star of David diamond ‘cloud’. 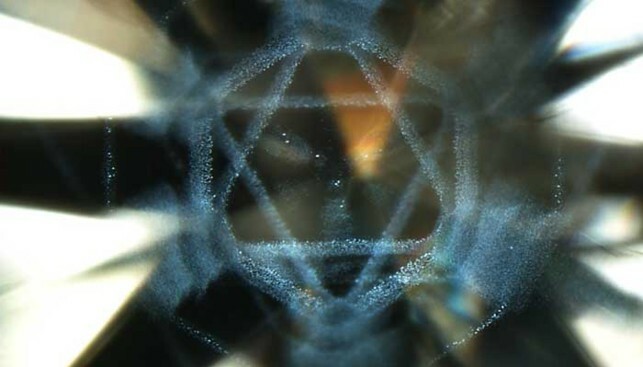 The internal inclusions in the diamond are arranged in two inverted equilateral triangles, which create the distinct shape of the Star of David. The diamond has been examined by the Gemological Institute of America (GIA), and found to be natural. According to the GIA, no other natural diamond on Erath has been found to resemble it. The owner of the diamond is an Israeli diamantaire who was just as surprised as the rest of the world by the unique cloud. The diamond was bought in Belgium as a 4.6-carats rough, and the cloud was discovered after the diamond was cut and polished. The Star of David is now located at the exact center of the stone, and the diamond weighs 1.67-carats. The diamond, which was discovered in 2008, was displayed at the Harry Oppenheimer Diamond Museum in Ramat Gan in honor of the 68th anniversary of the founding of the State of Israel. The news of the unique diamond travelled fast, and many visitors came to the museum to see it for themselves. The anonymous owner of the stone received many offers for purchase, and it remains to be seen if he/she will be willing to part with the Star of David diamond in the future.